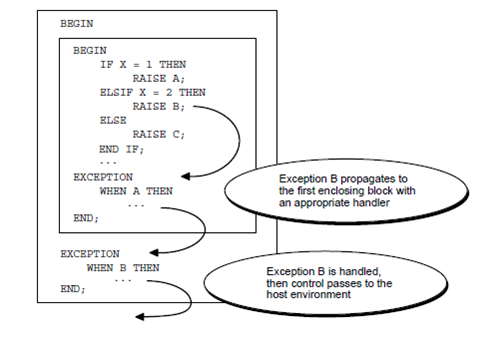 Whenever an exception is raised, and if the PL/SQL cannot find a handler for it in the present subprogram or block, the exception propagates. That is, the exceptions reproduce it in the succeeding enclosing blocks until a handler is found or there are no more blocks to search. In the latter situation, the PL/SQL returns an unhandled exception error to the host atmosphere. Though, exceptions cannot propagate across the remote procedure calls (RPCs). As a result, the PL/SQL block cannot catch an exception raised by a remote subprogram. As the block in which the exception past_due was declared has no handler, the exception propagates to the enclosing block. 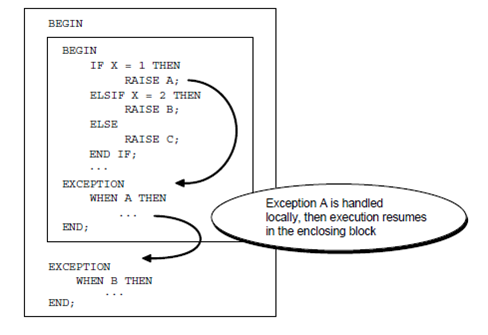 But, according to the scope rules, the enclosing blocks cannot reference the exceptions declared in a sub-block. Therefore, only an OTHERS handler can catch the exception. 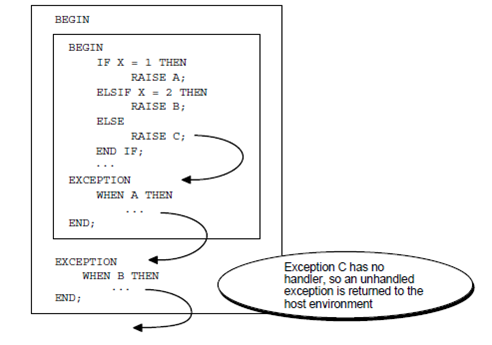 Write discussion on How exceptions propagate in pl/sql programming?